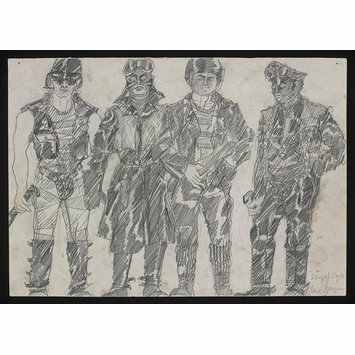 Costume design depicting four men wearing stylised, fetishistic combat uniforms mainly consisting of jack boots, leather trousers worn under studded leather jock straps, leather jackets, and a variety of military caps and helmets. Two of the figures hold coshes in their hands. This costume design by Maria Bjornson was amongst a collection of photographs and negatives purchased by the Theatre Museum from the photographer John Vere Brown in 1998. The design was executed for the world premiere of David Rudkin's play "The Sons of Light" performed by the Tyneside Theatre Company at the University Theatre, Newcastle-upon-Tyne on March 11th 1976. The production was directed by Keith Hack, and the lighting was designed by Phil Rowe. The cast included Alun Armstrong as Yescanab and Jonathan Kent as Corporal Gower. John Vere Brown worked as the official production photographer for the play. 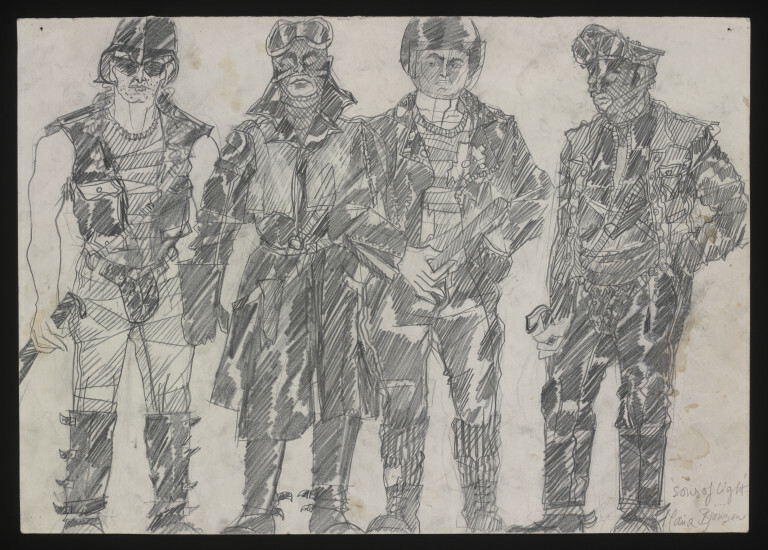 Costume design by Maria Bjornson for Four Men in "The Sons of Light", Tyneside Theatre Company, University Theatre, Newcastle-upon-Tyne, 1976.